For some reason yesterday I was feeling quite discouraged, and unable to write here. Today, suddenly, I am again energized. I want to be consistent in things, but either because of my disabilities, or because it is someone else’s will, not mine, I live on an amusement park ride in which some days I can do things, and some days I can’t, and I can never predict which it will be. Learning to live like this has been challenging, but the results have been wonderful. I am a happier person, better able to accept and appreciate whatever life throws at me. My life may look pretty pathetic to some outsiders, but that is their lack of vision, not my loss. Sometimes, on really bad days, my life looks sad to me, too. Then I just need to remind myself of all that is wonderful in my life. If it is a sunny day, like today, I start with the sun shining in my window. I love the morning sun like nothing else. Azrieli Towers, or Azrieli Centre, as seen from the Tel Aviv – Azrieli station platform. Not your usual view. בנימין – ‘Benjamin’ Although I have no idea why? 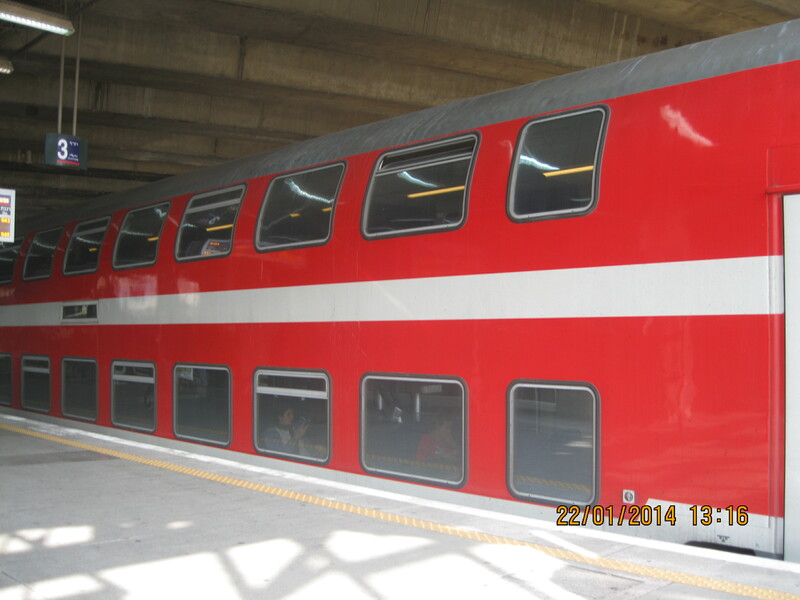 Is it a company that makes train cars, or paints them? If anyone has an answer to that last question, I would love to hear/read it. Thanks. Today was hoped to be a trip to Rosh HaNikra, the northernmost train station in Israel, but they haven’t opened the station yet so instead I am here in my comfortable room thinking all kinds of things, some related to travel some not. I could start a new blog for non-travel-related posts, but that is too much work on a lazy Sunday, and this IS a lazy sunday. Must be, I’m too worn out for anything else. My middle son and his fiancee had a bridal party, called a חינה (KHEE-nah) Thursday night. It is a Moroccan tradition, and the fiancee comes from a Moroccan family. It was extremely fun and exciting, especially for this cripple who actually stood up and Danced! Very briefly, very little, but still, it was a proper wedding-type miracle. My legs are still not happy with me. I don’t get to settle down and return to ordinary life yet. There is the trip to the mikvah. And the wedding itself. One thing I’ve been thinking about is the question ‘am I an introvert?’ It is hard to tell. I’ve spent so much time having to be constantly ‘on’ with people, either in person or on the phone, that I definitely crave alone time with a vengeance. On the other hand, I often spend so much time alone in my room – sometimes when the body is at it’s worst, I can not leave my room for weeks – that I find myself craving social interaction in a big way. I suppose even an introvert can crave social interaction after spending too much time alone. I have tended to think of myself as being more in the centre of the scale between intro- and extro-vert, but… I am desperate for time alone to recharge my batteries. And I find that there are days when five social interactions of whatever degree – facebook counts – are too much. Could I be becoming an introvert? Is it something one can grow into? A very good friend of mine, also long-term disabled, says that it is a part of becoming more disabled, that social interactions become too expensive in terms of one’s life energy. I am hoping that later this week I can manage a trip to Nehariah again by train with youngest son E. We want to visit a shop there, and the beach calls to me. It is a beautiful beach there, and if we go during the week it should be quite deserted. The only problem is that I/we need a third person to come along, as E is not experienced enough to handle the awkward bits with the wheelchair by himself, particularly if they don’t come along with the lift at any part of the trip. Unfortunately most of the able-bodied people in my life have real lives they cannot interrupt for such a tiyul, be it never so cheap and lovely. And I’ve been interrupted by my cat, Kitten. 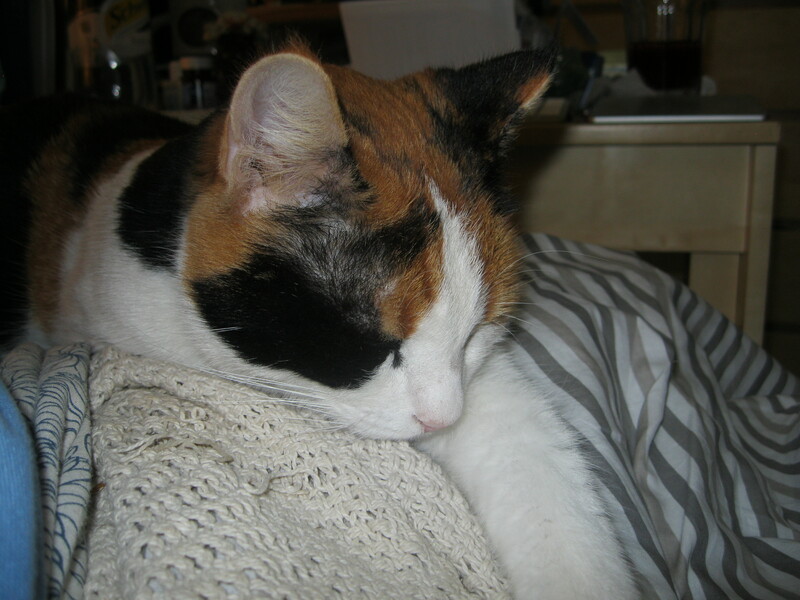 She is curled up and purring and making everything a bit more awkward, so I guess I will stop for now. More another time. The trip up was completely smooth. 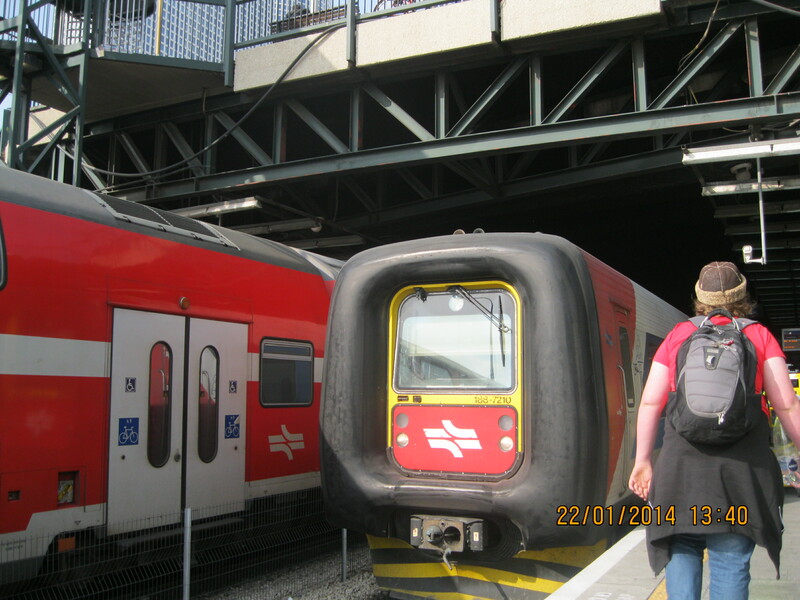 It appears that our reservations for help to get the wheelchair on and off the trains were not forwarded to the individual train stations, but since we arrived quite early for the first train, and the station master phoned ahead to the TA – mercaz station it was all seamless. I took the time to use the A++ wheelchair accessible bathroom at Sderot. I wasn’t even bothered by the hand drying options. Sometimes it is good to have nothing to complain about. (I would insert a proper smiley here if I knew how). 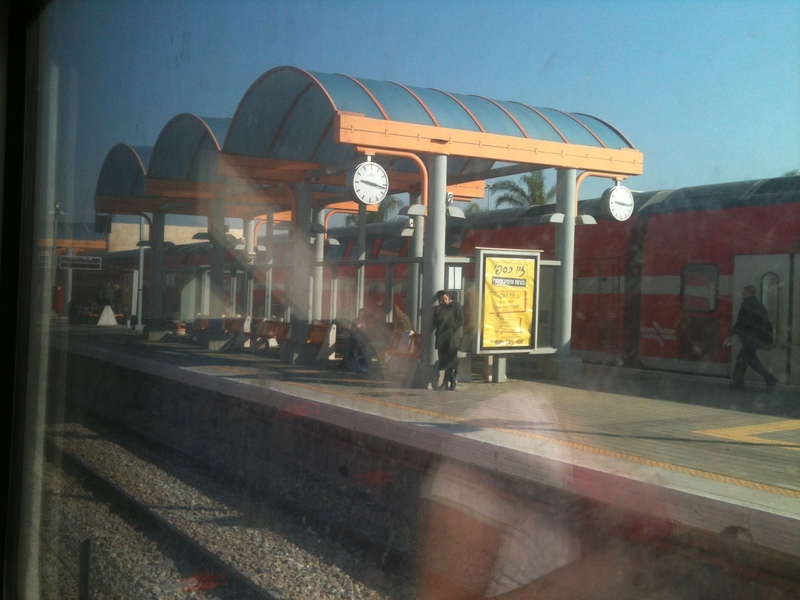 It was another Friday day trip, this time my daughter Havva, and two sons, oldest and youngest, along with a family of friends – mom, pre-schooler and infant, took the 9:02 train from Sderot to the Tel Aviv – Mercaz (central) train station. It was good for me that I finally got to see the TA – mercaz station, it is a really big one, and quite exciting with escalators and elevators all over the place and a variety of entrances and exits one of which – the one Havva said we wanted – was completely inaccessible by wheelchair. Not to worry, though, we ended up going out the entrance which was only half a football field away and reaching the busses with relative ease (no curb cuts). Riding on the busses was quite exciting. There is a space reserved for a wheelchair which has a seat belt that you can only use if the wheelchair user is facing backwards. How neat is that? Also a padded cushion for your head to snap pack on when the bus suddenly hits the brakes – as it does. Unfortunately the forcefulness of the busses starts, stops and turns is such that the wheelchair doesn’t *stay* in the designated space. On one particularly special lurch two of my wheels actually left the surface of the bus. Also the chair kept sliding outward so forcefully that my oldest son had to stand in such a way as to prevent the wheelchair, with his body, from taking off into the main aisle of the bus. This was with the brakes on, and my brakes are good. 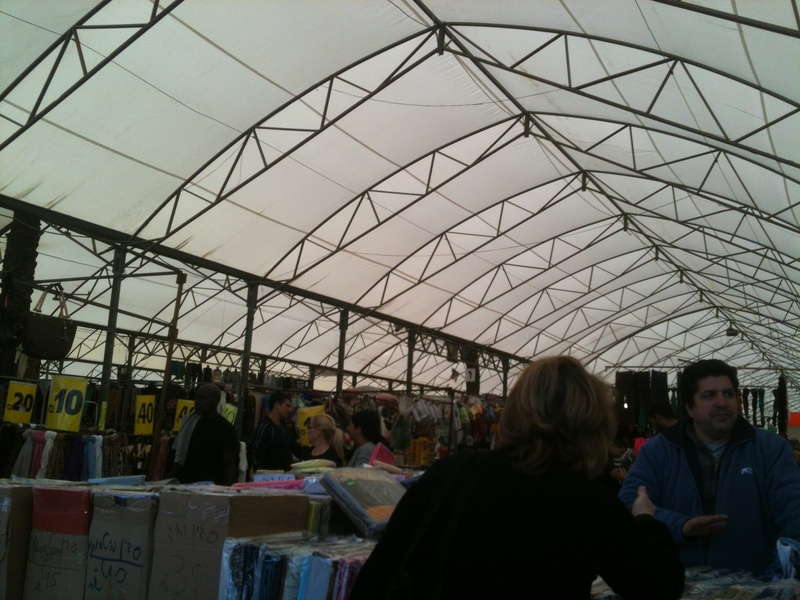 In any event the chocolate festival was being held in an old train station in south Tel Aviv/Yaffo. I didn’t, unfortunately, get any photos of the train station, but I did get of some of the chocolate sculptures, which were quite impressive. I can’t get them posted today, hopefully tomorrow. The old train station was a bit of a nightmare for navigating in the wheelchair, and several times one of the kids (whoever was maneuvering the w/c) had to drag it, and me, backwards across a surface that kept trapping the front wheels. There was a free chocolate with each entry ticket purchased, very yummy, and chocolate vendors selling almost anything you could imagine, including chocolate flavoured beer. I didn’t taste the chocolate flavoured beer myself, but I admit to a strong curiosity. We were only there for about an hour. For people like us, country people who are used to seeing a handful of other people a day in a general way, the crowds were quite a lot to take and we were very happy to get away from the noise after a while. There was a little shuk outside of the festival where we were able to get something to eat and/or drink, I bought some ribbon for knitting or crocheting baskets, and youngest son E got to watch what sounds like a really good juggling display. The descriptions were very impressive. I may have made a new friend, as well. We’ll see about that. The trip home was an adventure in it’s entirety. In the first place three tour busses had pulled up to the curb by the bus stop such that the bus couldn’t get next to the sidewalk. This meant bumping me down into the street, and then the pull-down ramp from the bus having to reach the street level, being so steep it too a great deal of effort to get the w/c with me in it onto the bus. The ride back to the train station was no less exciting, and complicated by a more crowded bus and us having more bags a packages then on the outward journey. Of course we’d all bought a lot of chocolate, what else? We did, however, arrive safely at the train station where we were able to get back inside with a minimum of fuss. Going home it was just my family group and we were all feeling tired and maybe a bit ready to be away from each other as well. Unfortunately, arriving a mere twenty minutes before the train was due, I didn’t dare to try and find and use the bathroom/washroom/toilets (choose your noun of preference). Not knowing where they were, knowing the likelihood of a w/c accessible w/c being locked and or otherwise unavailable, I simply couldn’t risk it with a mere twenty minutes. I commented to Havva that able-bodied don’t have to worry about running into such things, and she replied that they do, but infrequently, it isn’t a near certainty in ordinary travel. We waited on the platform, me with a full bladder getting ever more insistent. We discussed the various really bad results of having to hold on for too long. Not in too much detail, we know too well for that. We waited and wondered when the station personnel would come with the lift, or portable ramp. They never did. Of course, the train that arrived was one of those with three steep steps and the door level of the car being more than a foot below the platform. It was bad. My bladder was bursting. In one of those rare miracles that people are capable of in crisis situations, I somehow managed to drag myself up the stairs, leaving the wheel chair to follow me as quickly as possible so that I didn’t fall, thank goodness. Then another stressful scene, it was one of the ‘good’ w/c cars, but some fellow with a bicycle had parked his bicycle right in from of the w/c-water closet. The toilet – bathroom – services – what-have-you. I stressed. I yelled. Havva went down to talk to the fellow about moving his bike, but before she got there he seemed to have gotten the general flavour of the situation and moved elsewhere. Thank goodness. I actually managed to roll in, close the door, and transfer to the toilet without incident. And then, well, if anyone remembers the scene in A League of Their Own, it was like that. Pretty amazing, really, I didn’t have any idea I’d that sort of capacity. Once or twice I though I might be done, but, I was wrong. Not only that but suddenly I felt so much better. I became a nicer person. I smiled and gasped at what a difference an empty bladder made. Fun for everyone – okay that was sarcasm – but it *is* rather funny in a way. Then we had at least two talks with train personnel on the issue of no help having been available at the train platform. It appears that there was a mistake made and apologies were tendered. It was a truly unusual experience in that, in the normal way of things, no Israeli apologizes or admits fault without first exclaiming, declaiming responsibility, implying that it is somehow the injured party’s fault, and otherwise acting as if they were kindergarteners yelling ‘Not Me!’ An upfront apology and admission of responsibility almost made the rest worthwhile. Okay, not. But it was a nice touch. We were met at the Sderot platform with a lift on time. It really would be to everyone’s benefit to simply build trains that a wheelchair can roll onto. What if I hadn’t manage to lift myself up the stairs in Tel Aviv? 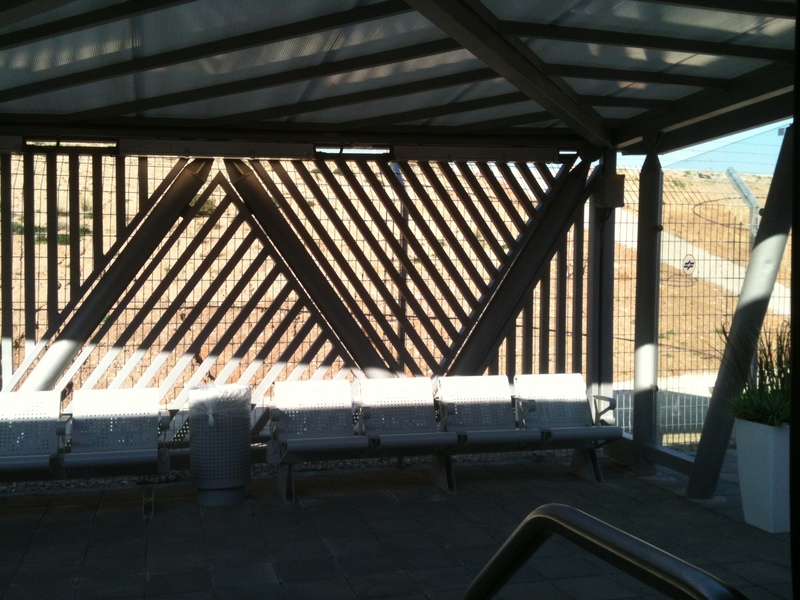 It was the last train to Sderot for the whole weekend. What if I’d fallen? It just isn’t reasonable, sensible, logical to make each person in a wheel chair require special assistance when the trains are available with lifts built in, when the trains are accessible by people on scooters, bicycles, people with dogs ride without any special arrangements… Israel is a small enough country that a standard could be set for platform height and for accessible cars that would be met throughout the country. But I won’t get caught up in that endless rant. It is endless because regardless of how sane and sensible it is to build for accessibility, it goes against the ingrained mindset of humanity. And, after all of that, I went home and collapsed, not to leave my bed until after I’d been visited by professionals on Sunday. And that is an entirely different rant. I’ve had so much I wanted to write here, but my life got hijacked by a wedding (my middle son is getting married in a few weeks) and various normal viscissitudes of life so here it is, another week and so many things still sitting waiting to get put up here. Tomorrow I’m going on another short train outing, getting off at Tel Aviv Mercaz, the one station I haven’t been off on yet in Tel Aviv. There is a chocolate festival which my daughter Havva let me know about and much of our family will be riding there. Excitement all ’round. The Husband isn’t coming, neither is daughter Simcha. Our first month of free train riding expires for most of us tomorrow, so TH, Simcha and youngest son Eliyahu, and I will be recharging our ‘rav-kav’ cards along with going on the tiyul. Always something new around here. And for tonight, before I dash off for the next thing I was supposed to get done at the beginning of the week, a few photos from some previous train trips. One thing I find fascinating is the windows on the lower level only just showing above the platform. An ant’s eye view. And The Husband. Don’t ask how long it took to grow the beard. 🙂 It’s okay, everyone does. More after our next trip. Last weekend, my middle son told me he was getting married here in Israel, in less than a month. So it’s understandable that I haven’t had time or enough brain to write for a while. I had a bunch more photos and such, but at this point it’s not worth going back and trying to remember it all. However, I did get out for another trip by train this Friday and took some photos. I am getting good at this thing, using the trains, and some of the people on the railway are starting to recognize and remember me. Fun and all to the good. I am enjoying traveling, and getting to know places and how to get around them. Another thing I am getting good at is dealing with busses. Nothing is going to make traveling by bus in a wheelchair particularly fun, especially the way bus drivers here swerve and accelerate. I found my wheelchair literally doing a wheelie while not moving on a bus at one particular juncture. Still, it gives me some ability to get out and travel which I haven’t had for a while. All the busses I’ve dealt with have a ramp someone has to manually grab and fold out of the bus, which means that I haven’t got any true independence, I still have to rely on other people which means taking one or more of my kids with me generally. Fortunately they are willing, and I am also learning ways I can help by (for instance) placing my feet on the ground to help lift the front wheels over curbs, bumps and when the ramp isn’t at all flush. This Friday we traveled by rail from Sderot to Rosh HaAyin, and by bus from the train station there to the shuk, and back in reverse. It was a lot of fun. The water closet in the car going home was just fine. I was already familiar with the peculiarities of the wheel chair accessible stall at the train station at Rosh HaAyin (once I am in the stall, there is really no way for me to shut the door, or lock it). The station personnel were all in the right places at the right times, and there were no untoward events like when we left some bags behind at the station. I took some photos from the trip. It was a beautiful day, the light was wonderful, and I forgot my camera (drat!). So these were taken with my phone. I can’t complain, it took the photos, and I did get some good ones inside the shuk. You can get almost anything at the Rosh HaAyin shuk. Except of course size 48 shoes for my 14yo, with the really huge feet.